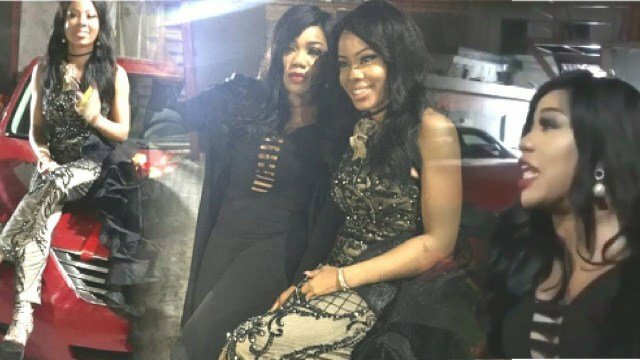 Toyin Lawani seems to be really rooting for Nina. Yesterday, BBNaija finalist, Nina clocked 22 and to mark the day, she had a birthday dinner and the unveiling of her hair line; Nina’s Empire. She had some of her fellow ex housemates like Cee-C, Vandora, Anto and Alex in attendance. Also, among those that graced the dinner was celebrity stylist, Toyin Lawani. At the course of the event, Toyin took everyone out, stating that she has a special gift for the ex housemate. To the surprise and admiration of all, the stylist handed the Imo born TV star a car key. Of course, she could not contain her joy as she screamed in encomium, among hearty cheers from all the guests.